A beguiling new approach to Adaptive Re-use. Currently Scotland has a varied and contrasting approach to ‘alteration’ and ‘re-use’ in any context. Clearly there is an obvious divide between the projects realised by architect-poets who call on a well honed intuition with a personally driven interest, and others, who deliver projects which damage and confuse the historic fabric in their eagerness to meet budget and client demands, developing the site with a lack of vision and little understanding of conservation principles. we need to address this haphazard approach to the re-use and alteration within Scotland’s built heritage, a re-use methodology should be obvious. Developing a conservation lead methodology where the host building plays a key role in its re-use design proposals, will re-configure the design process and help address the hit and miss culture of intervention projects whilst engaging with that elusive aspect of embodied energy within buildings. “All buildings, once handed over by the builders to the client, have three possible fates, namely to remain unchanged, to be altered or to be demolished. The price for remaining unchanged is eventual loss of occupation, the threat of alteration is the entropic skid, and the promise of demolition is of new a new building. For the architect the last course would seem the most fruitful”. Embodied energy is fast becoming one of the most important energy considerations in the built environment and increasingly an important factor in architectural conservation. In particular its buildings re-use methodology; assessing the embodied energy of an existing or historic building, reveals the cost of demolition and the viability in re-using the buildings. In today’s energy sensitive economy, custodians of the ageing and historic built environment are wrestling with the costs and practicalities of re-use and sustainability verses a new build scenario. Understanding the relationship between embodied energy and conservation methods such as alteration or re-use at the very start of a project can save money, a factor integral to any and all, government or private developer alike. Determining the value of a building’s re-use or rehabilitation, maintenance costs, and overall energy benefits requires a process that provides a comprehensive assessment of the building. Embodied energy is determined by the amount of labour and energy consumed in the fabrication of a building, from the harvesting of natural resources, to the manufacture and delivery of materials and installation of these materials and products. It also includes the energy required to demolish and remove building components. Embodied energy reflects a cradle-to-grave philosophy and is critical to any sustainable approach in managing and conserving our culturally significant built environment. Currently there is a worryingly haphazard and polarised approach to the design process when tackling an intervention project within Scotland’s built heritage. Therefore an alteration methodology is required with its primary focus on developing a considered design approach. This would facilitate sustainable development as a means to protect and manage venerable historic buildings with cultural significance. Big Stone Collective is a contemporary new practice on the block, based in Scotland the practice has developed a particular architectural methodology in regeneration ,design tools and tactics and analytical process from which to facilitate the successful process of building re-use. ‘The Interiorist’ approaches the buildings its spaces as a doctor would his patients. The Interiorist will give an initial consultation, assessment & prognosis offering a prescription or recommendation. Depending on the extent of the illness, whether physical, psychosomatic or merely first-aid, the Interiorist can refer or treat the issues in-house accordingly. Frazer Macdonald hay the director of the Big Stone Collective explains, “The Big Stone collective is a multi-disciplinary response to architectural, spatial, conservation and creative problem solving, the collective is divided into three main strands, research, education and consultancy. The collective has a wealth of experience and knowledge, we pride ourselves in delivering innovative thought and processes to develop and deliver creative design solutions for our clients”. Frazer Macdonald Hay is a Specialist in Architectural re-use and Intervention, Interior Architecture and Architectural conservation. Frazer is the owner of Big Stone Collective and a part time lecturer at Edinburgh University and College or Art. A former fireman and African expedition leader, Frazer was relatively late to the profession but has since become a leading figure in his field and is now the Educational Chairman of SBID [society for British Interior Design], the Educational consultant for ECIA [European council for interior architecture] and a member of the Scottish Parliament committee for Architecture and the built environment. 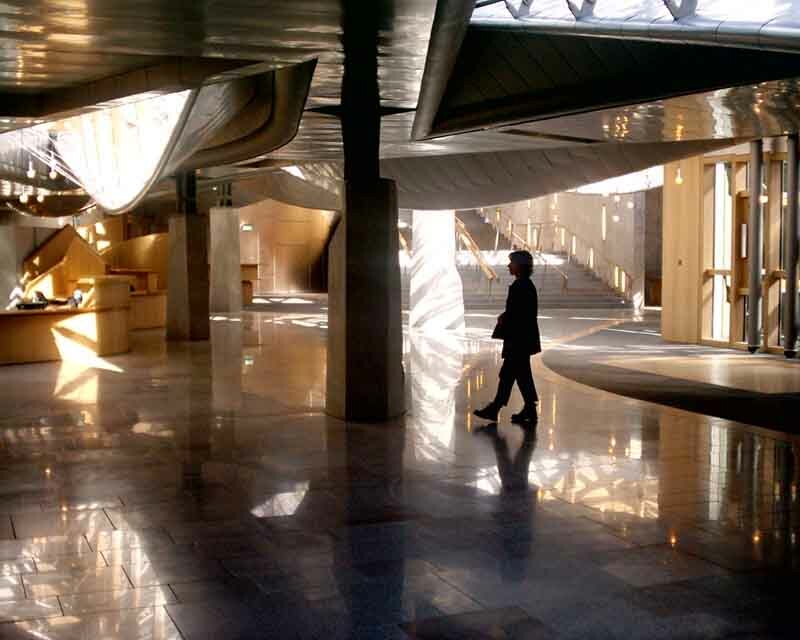 Frazer has work internationally and nationally on iconic buildings such as the new Scottish Parliament building and Stirling’s Tolbooth Arts centre. Frazer also runs workshops in design and architecture in Belgium, Holland and Norway.